Want to be at the head of the class? 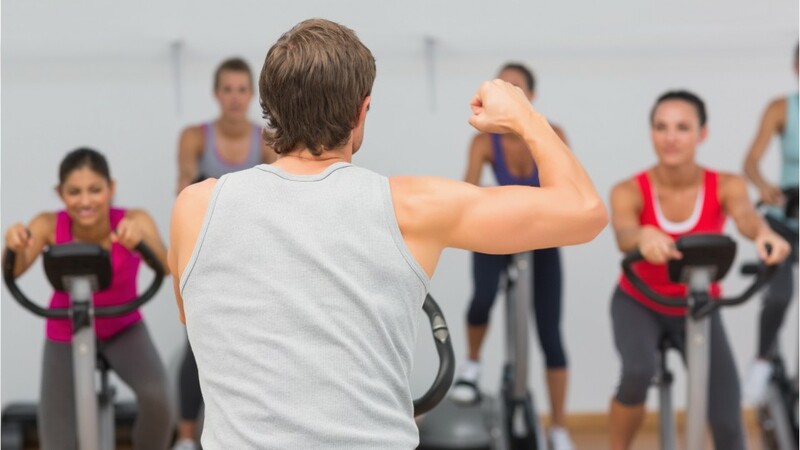 Fitness trainers and aerobics instructors are leaders of all their classes, leading exercise groups at health clubs, exercise studios, and other facilities. They demonstrate correct exercise form and the proper use of equipment. These teachers also instruct students on weight training, flexibility, aerobics, and other workout styles, often developing programs for people with special needs or goals. Aerobics instructors plan routines that work different sets of muscles and combine a high-energy sweat session with music. The job may require maintaining equipment and keeping records, as well as promoting membership and enrollment in a gym or health club. Good communication skills and an approachable manner are essential; some positions may require expertise in weight control and nutrition. Running several classes a day requires stamina and energy, so it's expected that you be in good physical condition. Many instructors work in the field part-time. Instructors often enter the field with experience in fitness classes, dance, or other sports disciplines. Certification in first aid, and in a fitness field such as personal training, weight training, or aerobics may be required. Becoming a fitness trainer is a great way to share your commitment to an active lifestyle. See more details at O*NET OnLine about fitness trainers and aerobics instructors. Fitness Trainers & Aerobics Instructors by U.S. Department of Labor, Employment and Training Administration is licensed under a Creative Commons Attribution 4.0 International License.